Left to right are Hampton Academy students Norah Wilcox, Baylee Jacobs, and Vivienne Arsenault taking instructions from retired teacher Lori Cotter. Join Hampton Academy 8th graders as they celebrate National Poetry Month on Thursday, April 18, at 6:30 p.m., at the Tuck Museum. The students will be reading poetry they have written about Hampton history. 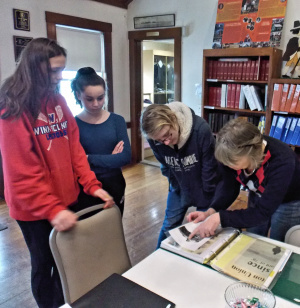 They have been meeting at the museum with retired Hampton teacher Lori Cotter and other Hampton Historical Society volunteers to discuss poetry, Hampton history and writing poetry. The students were chosen to participate in the poetry program by their Language Arts and Social Studies teachers. According to Cotter, the students are researching Hampton's history to provide details for their poems. "There's quite a bit of interest in the lore and legends of Hampton's ghosts," she noted. The Hampton Historical Society is sponsoring the program. Light refreshments will be served.